Individuals with diverse abilities met with legislators at State Capitol - Opportunities, Inc.
On March 2, individuals with diverse abilities, their family members, and advocates gathered from across the state to meet with their legislators to ensure service options and opportunities continue to advance. The event was hosted by A TEAM Wisconsin, a grassroots group that promotes advocacy, awareness and advisement from a diverse ability perspective. This was their fifth Day for Choice. It has continued to grow each year as the movement expands throughout the state and nation. Over 120 A TEAM members spent the day meeting with nearly 50 legislators to promote the importance of independence and work choice, as well as share their powerful testimonies. Self-advocates with diverse abilities along with their family members advocated for a choice in where they work and not for the government to regulate. Among the 120 advocates at the capitol were many family members meeting their legislators for the first time. “It was my first experience participating in the Day for Choice and I would love to do it again. I learned so much about the power of our voices as we talked to our senators and representatives. I realized we do count and they are just people like us and all seemed very willing to hear what we all had to say,” said Pat Jelinek, A TEAM family member. “Day for Choice was so wonderful and meaningful as our group had a chance to share their stories with our legislators and their staff. I was proud to be a small part of this venture to advocate for the citizens that so need and appreciate the work experiences. It was a very successful day!” Mark Brieman, A TEAM family member. 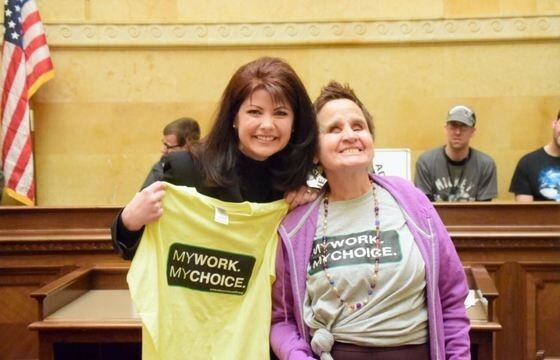 Becky Erdman, self-advocate and longtime A TEAM member finalized the day with a simple and powerful thought, “It is important for us to be able to meet with legislators so we can have a choice of where we work,” said Erdman. For more information on the A TEAM, visit www.ateamwisconsin.org. Lt. Governor Kleefisch poses with A TEAM member. Rep. Cody Horlacher enjoyed having A TEAM members Barb LeDuc, Michelle Bolger, Tara Breiman, Mark Breiman, Alex Ingebretsen, and Tammy Oper share their stories. A TEAM members Robin Kennedy, Angie Smith, Brenna Larson, and Becky Erdman pictured with Rep. Jimmy Anderson. Rep. Sondy Pope met with A TEAM members Alan Schuett, Cynthia Williams, and Michelle Stocks. A TEAM Southeastern Wisconsin chapter from Fort Atkinson pictured with the Lt. Governor.